With no other boats around and a quiet, calm morning on the water we were able to slowly drift in the current beside this fin whale while she swam along. I can still clearly remember the sound of her breaking through the water’s surface and forcibly exhaling before taking another breath and slipping back beneath the water. 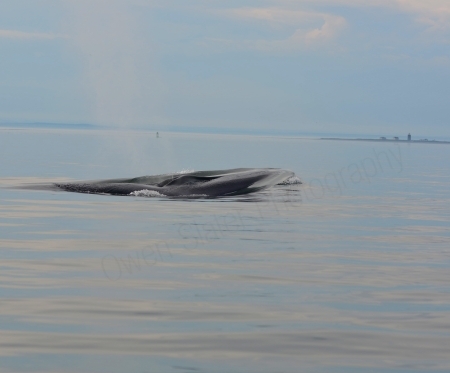 This magnificent female fin whale has been returning to the St. Lawrence every year since 1989! While it’s hard to appreciate the scale in this photo, this whale is huge. Fin whales are second to only blue whales in terms of length (up to 27 metres or close to 90 feet) and weight (45,000-64,000 kg or 50-70 tons). You would think with this much mass that they would be very slow swimmers, but they are actually one of the speediest, reaching speeds of up to 37 km/hr or about 20 knots. This one was taking a bit of a break from feeding on krill and was just lounging around when we visited it. 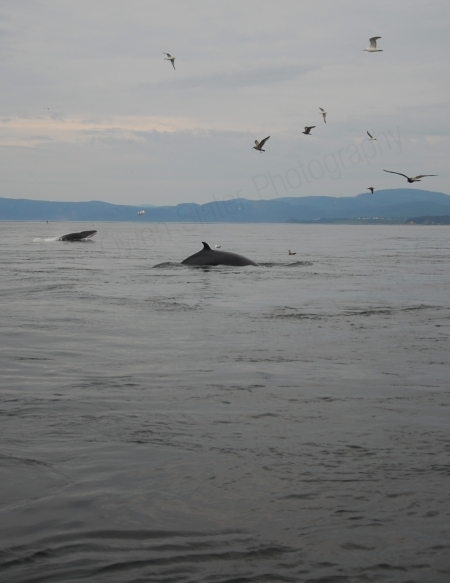 Apparently the St. Lawrence estuary is still a relatively unknown location for whale watching at this time of year (though they get about 1.1 million visitors per year), which is surprising given how numerous the whales are during August through September. A total of 13 different whale species can be seen in the estuary. They come for the abundant food created by the nutrient rich, cold, oxygen saturated waters. In under two hours we spotted minke, fin, and beluga whales as well as grey seal and harbor porpoise. With the early morning start (7am) we were the only boat around, the waters were calm and the whales were actively feeding. This photo, as with many, was a bit of good luck. With the wide angle lens on the camera focused on the closet whale, the one in the background burst through the water just as the photo was taken and captured the head and white chin of these whales. The best way of predicting where the minke whales would surface was by watching the herring gulls. The gulls, initially circling above, would spot concentrations of krill, land and start feeding just before a whale would explode through the water surface and gulp down as many of the invertebrates as they could. The gulls would quickly have to get out of the way or risk being collateral damage from the feeding whales! Our guide had positioned the zodiac several hundred meters in front of a group of killer whales and turned the engine off. We waited several minutes and were just about to leave when this orca surfaced right in front of the boat and swam underneath us. With a week left of holidays I decided to head out to the west coast. I headed over to Vancouver Island and went down to Victoria as I had heard from a friend that the killer whales were in the area. There are 3 groups of resident killer whales in this area totally about 95 animals and they feed exclusively on fish, specifically salmon. Transient killer whales, which I didn’t see, roam up and down the coast in small groups or as individuals and feed on marine mammals, mainly seals.